Unique fabrics of sound, tailored for ambient soundscapes, soundtracks and creative sound design. In simple terms, EZkeys Cinematic Grand is a prepared piano – a traditional instrument that’s had its sound altered by objects placed on or between the strings. But in this case, that’s simplifying too much. 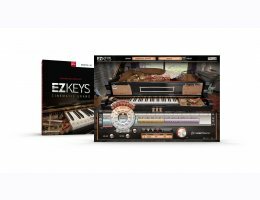 EZkeys Cinematic Grand presents an all-new hybrid instrument where perfect fidelity meets altered harmonics and layered textures to form never-before-heard piano timbres. Based on a classic Bösendorfer from 1891, this one-of-a-kind instrument was recorded in four individual configurations – one where horsehair was used as a bow on each piano string (‘Bowed’); one where the strings were struck by hand (‘Plucked’); one where various preparations were added to generate a muffled tone color (‘Damped’) and, in opposite, one where the overtones were exaggerated, producing an ambient and soaring timbre (‘Harmonic’). These four configurations were then saturated with various chains of sound-shaping effects and used in different combinations to form unique fabrics of sound. Welcome to a piano that goes well beyond the tradition, ready to serve as sonic backdrop to virtually any mood, narrative or audio scene you can imagine. This is the ultimate “grand piano” for out-of-this-world compositions, just as perfect for soundtracks as it is for any stripe of modern music production or sound design. Prepare to be inspired.